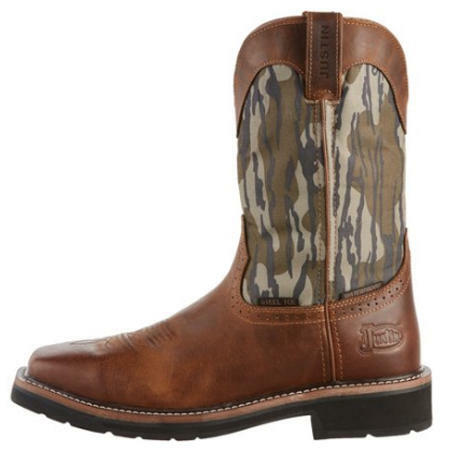 WEST POINT, MS –Get to work with the Justin Men's Stampede Trekker Bottomland Camo Waterproof Wellington Work Boots, which help keep your feet dry and comfortable. Stampede rubber outsoles provide slip-resistant traction, and the Mossy Oak Bottomland® camo pattern adds a rugged touch. EH rated. Mossy Oak Bottomland is the pattern that launched Mossy Oak more than 30 years ago. Driven by the desire to get closer to turkeys in his home state of Mississippi, Toxey Haas turned a handful of bark, sticks and leaves into a extremely lifelike hunting pattern unlike anything the world had seen. Featuring a legendary outline-breaking ability that helps hunters blend into dark hardwoods, flooded timber and treestand environments, this classic pattern remains every bit as effective three decades later.